Continuing where I left off in this series of Matthew's Gospel, we finally arrive at the center of the book: chapter thirteen. As usual, with the way I prefer approaching each section of the Bible, identifying the literary structure is very important. It's not crucial or absolutely essential to a proper interpretation of every section, but it's extremely valuable to identify nonetheless. But chapter thirteen poses a few dilemmas in this regard. Some aspects of the structure are obvious, but because of multiple overlapping layers, it's difficult to reduce the overall structure to something simple. At first glance, what is most obvious about chapter thirteen is that it's one of the five "pillar" discourses of Matthew's gospel, and it clearly begins at verse 1 and ends at verse 52. Verse 53 begins a new section with the literary marker, "and when Jesus had finished...", as found at the end of each of the five "pillars" of Matthew's gospel. A second glance will show that chapter 13 consists entirely of parables and explanations about parables. There are seven parables about the "Kingdom of Heaven" and an eighth parable addressed to the twelve apostles about scribes being trained for the "Kingdom of Heaven." A few more glances will show similarities between parables. For example, the first parable (the parable of the sower) is presented and explained later on. The same is true for the "parable of the tares." That too is presented and then followed by a detailed explanation. Also, between these two parables (the parable of the sower with it's explanation and the parable of the tares with its explanation), there are two quotations from the old testament Scriptures in reference to "fulfillment." Even a cursory glance at the way modern bibles often subdivide each chapter into smaller sections will make this appear very obvious. This arrangement certainly seems intentional on Matthew's part. But that's not all. There are also a handful of very brief parables, sharing similarities between them. 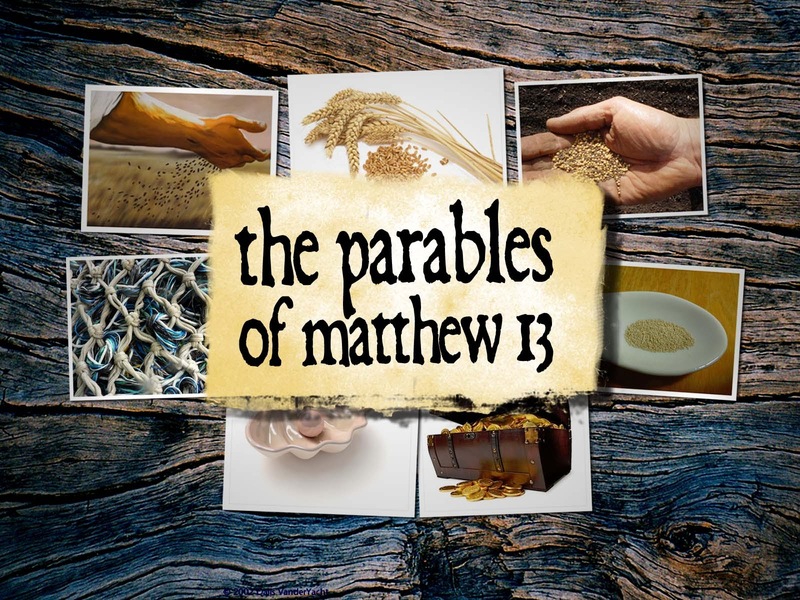 The third and fourth parables, the parable of the mustard seed and the parable of the leaven, are similar in meaning to each other. The fifth and sixth parables (of hidden treasure and a merchant who finds a pearl of great value) are both similar in meaning to each other. In my own attempt to outline the structure of chapter thirteen, I came up with three potential layouts, the first of which is very similar to France's chiastic outline above, and the last of which is similar to the triadic outline of Davies & Allison. Perhaps most important aspect worth noting about each of my outlines (below) is the three fold division & progression of sowing, cultivating, and harvesting. That, to me, seems to be the logical progression of each triad of parables.